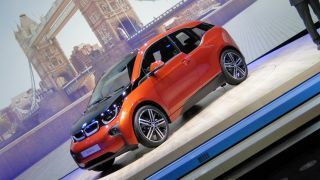 BMW has revealed the final production version of its i3. All electric, made from carbon fibre and integrated into the broader transport system, it's the first in a range of 'i' models that will revolutionise personal mobility, according to BMW at least. We've been hands on and spoken to some of the key BMW personnel behind the revolutionary new model. A big part of the i3 package is what BMW calls integrated mobility. To learn about that, we need to hook up with Che Franke, the BMW i ConnectedDrive expert. ConnectedDrive is the internet-connected part of BMW's iDrive multimedia platform. "The BMW i3 is a complete mobility product," says Franke. "That starts with a SIM for data connectivity in every i3." "This complete mobility is integrated into the navigation system and apps." What that means in practice is enhanced versions of BMW's existing smartphone app and the ConnectedDrive in-car system. For starters, the app gets the usual electric car stuff - charging status, range status, the ability to schedule charging remotely and preheat the cabin. Where things get a bit cleverer is the broader question of mobility. "We're working on an ecosystem of mobility that integrates public transport information into the navigation," says Franke. In practice, for instance, that means the i3's navigation system might guide you to a park and ride location. You then step out of the i3 and your BMW smartphone app seamlessly takes over the navigation duties, guiding you all the way to your city centre destination. Again, this part of the BMW i3 proposition isn't quite finalised. Franke says BMW isn't quite ready to announce full details of exactly which cities, services and public transport networks will be fully integrated into the i3's navigation platforms. In theory, then, the BMW i3 sounds great. But a lot will come down to the detail implementation. Has BMW really sorted access to charging? Does the integrated mobility tech really work? But first, let's talk basics. The BMW i3 is a four-seater car with a novel dual-suicide door arrangement. The front doors are normally sized and operate in a conventional manner. But the rears are smaller and hinged at the back of the car. There's also no middle pillar, sometimes known as the B-pillar, between the two doors. So, with both doors ajar, the result is a very large, airy opening for getting in and out of the i3. That's actually possible thanks to what BMW calls the LifeDrive structure. It's a carbon-fibre passenger cell to which the chassis and powertrain components are attached. BMW says the use of carbon-fibre on this scale is a first for a mass-produced car. Next up, the gubbins that makes the i3 move. Here we're talking 170hp electric motor and an 18.8kWh lithium battery. Factor in a fairly modest 1,195kg kerb weight, again in part enabled by the use of carbon-fibre, and you have a pretty nippy electric car. BMW says it will hit 62mph in just 7.2 seconds. That's junior hot hatch territory - it's not far off cars like Ford's Fiesta ST. Intiial step off thanks to the instant torque of he electric motor is even better. It'll nail 37mph in just 3.7 seconds. As for range, always a big question for an electric car, BMW is quoting 81 to 99 miles in normal usage with 12 miles if you use the energy-saving ECO PRO+ mode, which limits things like climate control usage in return for a few more miles. You also have the option of of a tiny 650cc range-extending petrol engine. It doesn't drive the wheels, it just keeps the battery topped up and improves the maximum range to 180 miles.